After the splicing work in mid-December week we have 71 (36%) of all the properties in the glen connected, including Rhuveag, all of Craigruie and the Boathouse. 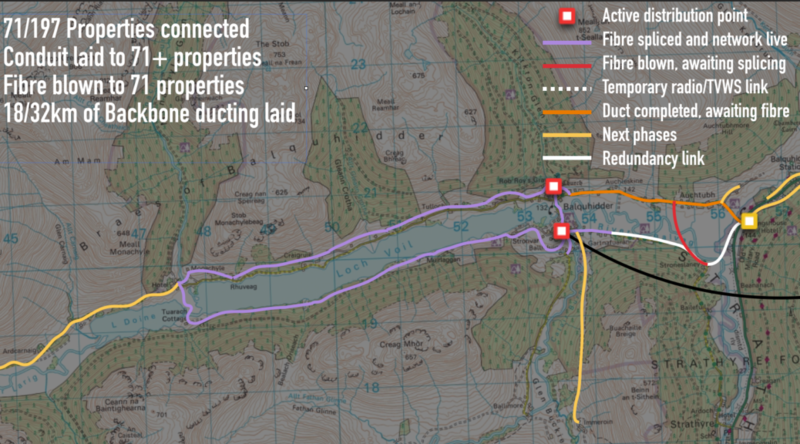 The full loop around Loch Voil is now complete, which enables us to start work on reaching the outlying properties towards Inverlochlarig and Immeroin. Monachyle Mhor is now at last online itself. Completion of the final backbone ducting from Auchtubh to Mhor 84 is just awaiting final agreement from BEAR Scotland, after which we can get our contractor to work on the road section of that dig. As soon as that’s complete, we can blow fibre east from the village and start splicing and connecting everything between Auchleskine and Mhor 84. So the temporary radio link to Monachyle Mhor is now no longer needed and the experimental TV Whitespace (TVWS) system that was being tested between Stronvar and Tulloch has also been decommissioned. We did have a brief outage of properties connected to the village hall cabinet on 4 December after a general power cut, after which the switch did not restart itself properly. That was simply because the uninterruptible power supply planned for the hall cabinet had not yet been installed – the main cabinet at Stronvar carried on perfectly during the power cut. Once the network is complete, all cabinets will have battery back-up in the event of power cuts. A couple of other minor outages on the Stronvar side were simply due to connections being moved to the new main switch. Whilst we haven’t achieved our goal of having the main network complete by the end of 2018, we now hope to do so in Spring 2019 – the very nature of a volunteer-led project that has to cope with Highland weather, external bureaucracies, difficult terrain and people’s available time means that everything does become a bit of a moveable feast. That said, we’ve had some great turn-outs on working parties over the year, so here’s a huge thank you to all our intrepid volunteers, and here’s to that continuing into 2019. And, for everyone who’s asked what we’ll all do with ourselves after the build is complete, all I can say is, “Watch this space…”. Well done to you all, amazing courage and determination by people of grit, helping themselves and their community.